Fill out a form for more information and to see how your organization can join our efforts. Please visit the NCPA Legislative Action Center to send letters to Congress by email. Medicare beneficiary access to prescription drugs is impeded by mandates from insurance middlemen (pharmacy benefit managers or PBMs) that effectively dictate which pharmacy to use based on exclusionary "preferred pharmacy" arrangements between PBMs and, often, Big Box pharmacies. Independent community pharmacies are not allowed to participate in some of these arrangements, even if they offer to accept the Medicare prescription drug plan's same contract terms and conditions. This can raise access issues for patients in underserved areas in which independent community pharmacies are predominantly located. 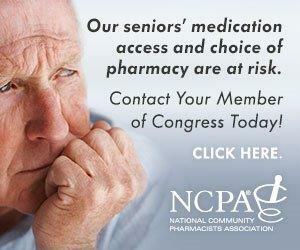 The Ensuring Seniors Access to Local Pharmacies Act (H.R. 1939/S. 1044), is bipartisan legislation that would allow pharmacies located in medically underserved areas and that are willing to accept the contractual terms and conditions to participate as a preferred pharmacy, sometimes referred to as "any willing pharmacy." Allowing the patient to choose the pharmacy that best suits their needs – Increased competition gives consumers more options to choose a pharmacy that's best for them. Enhancing access for seniors in underserved communities – Some patients currently face onerous trips to access discounted copays at a Medicare drug plan's "preferred" pharmacies. Most of these drug plans fail to meet the government's convenient access standard in urban areas. In less populated areas patients may have to travel 20+ miles to reach a "preferred" pharmacy. Increasing choices for patients with special needs, including those for whom English is a second language, who rely on the personalized care of community pharmacies that are often excluded from "preferred" status. 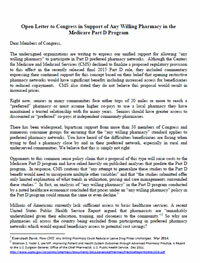 Past iterations of the Ensuring Seniors Access to Local Pharmacies Act have been endorsed by leading national patient advocacy organizations, including The AIDS Institute; Alliance for Retired Americans; Center for Medicare Advocacy, Inc.; Families USA; HealthHIV; Justice in Aging; LeadingAge; Medicare Rights Center; National Consumers League; National Grange: National Rural Health Association; Services and Advocacy for Gay, Lesbian, Bisexual and Transgender Elders (SAGE); and U.S. Pain Foundation. Moreover, Federal Medicare officials have concluded that the any willing pharmacy policy is "the best way to encourage price competition and lower costs in the Part D program." 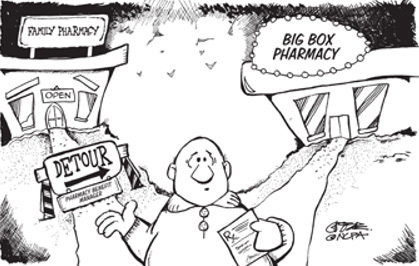 Sweetheart arrangements between drug plans and Big Box pharmacies can actually INCREASE costs. There is also public support for this proposal as three-out-of-four likely voters (76%) support this policy, according to a national poll by Penn Schoen Berland. Support for the proposal is high among Republicans, Democrats and Independents alike. Pharmacy benefit managers (PBMs) foisted "preferred pharmacy" networks and PBM-owned mail order on to the Centers for Medicare & Medicaid Services (CMS) with the promise of grandiose cost savings. In fact, five separate analyses of Medicare data have shown that preferred pharmacies and/or mail order are often more costly for the program. There is "insufficient basis" for opponents of any willing pharmacy to claim that Medicare drug prices will increase, and the policy could even reduce the program's cost, according to an independent economic analysis. The analysis was prepared by economist Dr. David Eisenstadt, veteran of the U.S. Department of Justice Antitrust Division and Principal at Microeconomic Consulting and Research Associates (MiCRA). The large corporate giants that have profited mightily from the proliferation of preferred pharmacy networks to date are continuing to distort the facts to protect their market positions even in the face of data that these arrangements are potentially harmful to beneficiary health. While any willing pharmacist receives broad based support from consumer organizations, a diverse bipartisan co-sponsorship list, and the public, Congress still needs to hear from pharmacists and patients. Make an appointment to speak to your federal representatives when they are back home. Click here for tips on scheduling a meeting with your member of Congress.